The SQL PRIMARY KEY is a column in a table which must contain a unique value which can be used to identify each and every row of a table uniquely. 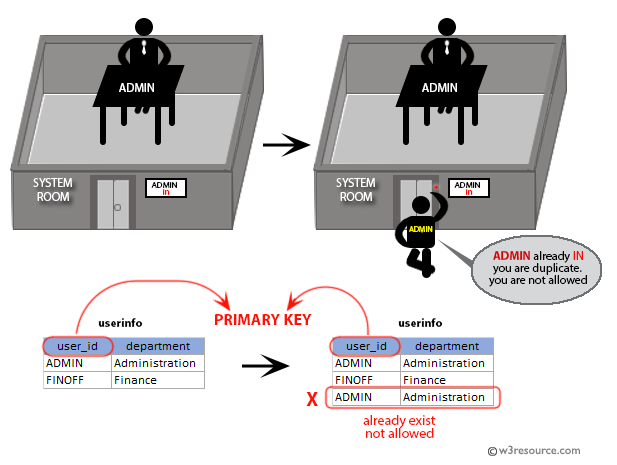 However, SQL supports primary keys directly with the PRIMARY KEY constraint. Functionally, it is the same as the UNIQUE constraint, except that only one PRIMARY KEY can be defined for a given table. PRIMARY KEY's will not allow NULL values. A primary key is used to identify each row identically in a table. It may be a part of the actual record itself. The SQL PRIMARY KEY can be made up by one or more fields on a table and when it happens, they are called a composite key. Primary keys can be specified at the time of CREATING TABLE or the time of changing the structure of the existing table using ALTER TABLE statement. This constraint is a combination of a NOT NULL constraint and a UNIQUE constraint. This constraint ensures that the specific column or combination of two or more columns for a table have a unique identity which helps to find a particular record in a table more easily and quickly. data_type Is char, varchar, integer, decimal, date and more. Primary keys should be as small as necessary. Prefer a numeric type because numeric types are stored in a much more compact format than character formats. Primary keys should never change. Do not use passport number, social security number, or employee contract number as "primary key" as these "primary key" can change for real world situations. Suppose, we are going to create a table named 'agent1'. It contains the columns and data types which shown bellow. For each row of 'agent1' table, it is required to identify each agent with a unique code, because the name of two or more agents of a city of a country may be same. So, it is not a good choice to create PRIMARY KEY on 'agent_name'. The 'agent_code' could be the only and exclusive choice for a PRIMARY KEY for this table. SQL PRIMARY KEY CONSTRAINT is a combination of a NOT NULL constraint and a UNIQUE constraint. This constraint ensures that the specific column or combination of two or more columns for a table have an unique identity which helps to find a particular record in a table more easily and quickly. In the following topic, we are going to discuss the usage of SQL PRIMARY KEY CONSTRAINT along with the CREATE TABLE statement for two or more columns.